I'm sure I'm not alone when I say my skin is a total nightmare in the wintertime. My lips, in particular, are a real trouble spot. Apparently an entire tube of chapstick a day just isn't enough to keep them moisturized because those puckers continue to stay chapped and dry. Using this diy lip scrub is one of the only things I'v found to help. I'll use it every couple days, along with scrubbing my lips with an old toothbrush (tip: rubbing your lips with an old toothbrush and a drop of peppermint oil is a great way to naturally plump your lips before applying lipstick). Since today is Valentine's Day, I thought there was no better time to share this diy lip scrub, as I'm sure you'll want to have those puckers in tip, top and smooth shape. 1. 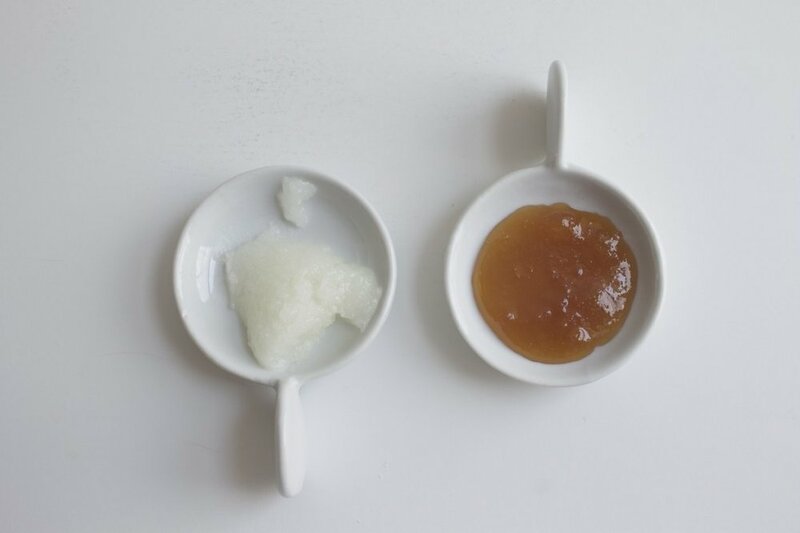 For the most basic lip scrub, you simply need coconut oil and honey. You can also use this mixture as a base carrier for other ingredients. 2. To make the scrub with additional ingredients, mix together equal parts honey and coconut oil. I usually do about 1 tablespoon of each. 3. I chose to make a brown sugar grapefruit scrub, so next I will squeeze in about 1 teaspoon of fresh grapefruit juice. If you are using any other extras, now is the time to add them. Play around with your measurements...something like cocoa powder you would use a teaspoon of, but peppermint oil would only require a few drops. 4. Finally mix in about a teaspoon of brown sugar (or the exfoliant of your choice). Bottle it up and store in the refrigerator for up to 3 weeks. Just remember to take it out of the fridge about 30 minutes prior to using, or run it under hot water to loosen the oil up. Use a spoon to stir it up if necessary. Then rub a small amount on your lips for 30 seconds before rinsing off with warm water.